I have walked into more than one local yarn shop and found myself in the middle of 'the debate'. It's a discussion with passion on both sides about the perks of cardigans versus the pros of pullovers. 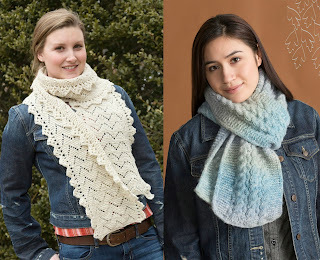 We knitters and crocheters are known for having strong preferences and this is no exception. 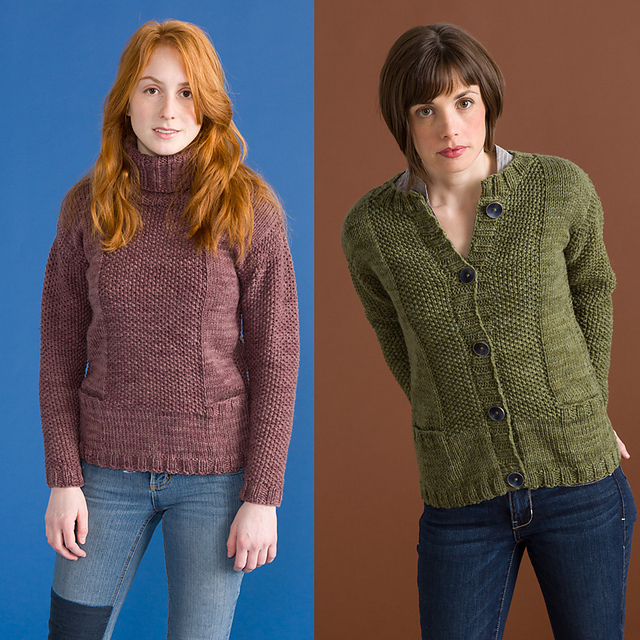 In our new book Emerald Isle, 'Skibbereen' makes both sides happy by including the option to make this sweater as either a casual pullover or a five button cardigan, both knit in the tonal shades of Big Liberty Wool. 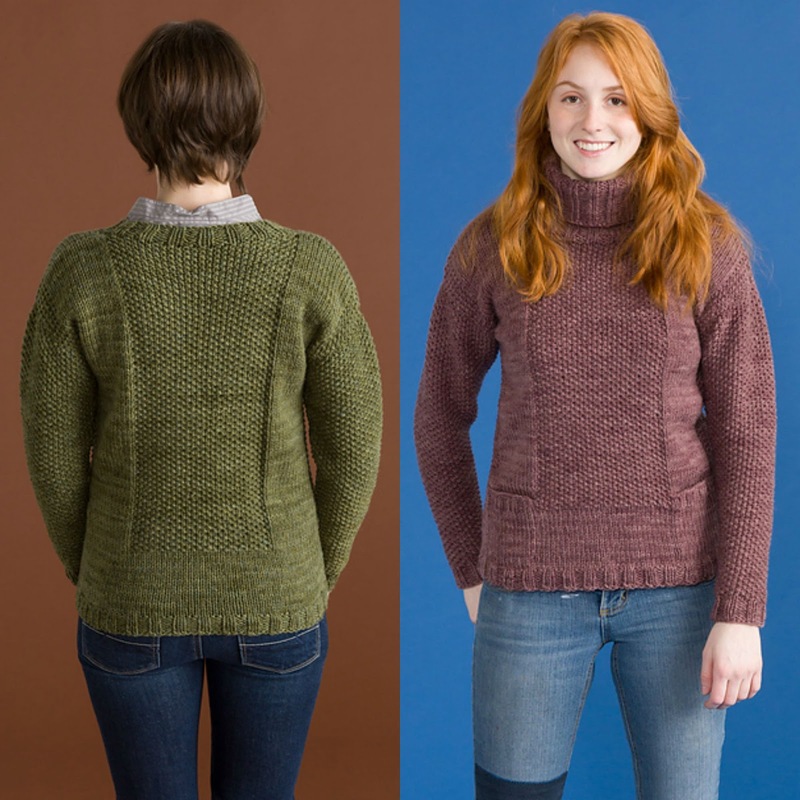 No matter which sweater style is your preference, 'Skibbereen' has the great details that we all love in hand knits. First there are the pockets. 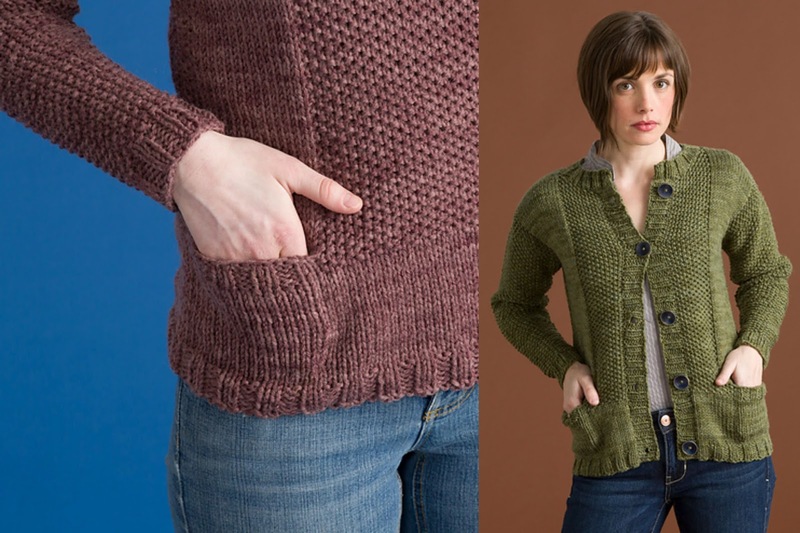 Topped with ribbing and set into the sweater fronts, the pockets on both the cardigan and the pullover are cozy and convenient. The textural Seed stitch adds interest to the sweater both in front and in the back. I love how the tonal shading of the Big Liberty Wool looks in this stitch. 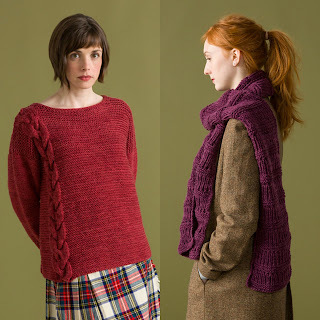 To tie it all together, the sleeves are worked in Seed stitch from the shoulders down to the ribbing at the cuffs. 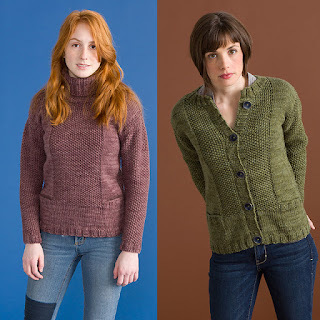 The classic shaping of both the cardigan and pullover versions of 'Skibbereen' will make either of them a welcome addition to your fall wardrobe. 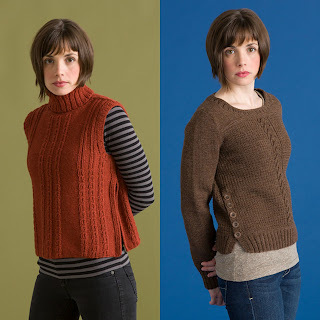 Which side do you fall on in the pullover versus cardigan debate? We knitters know that if you want to get that new piece done in time to wear this fall, the knitting must begin soon. 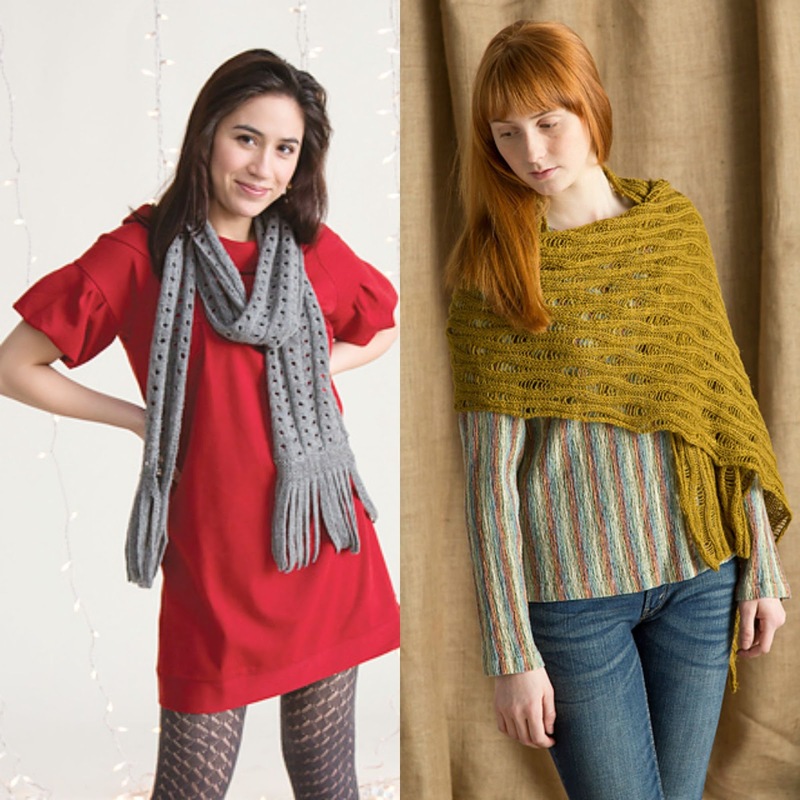 With that in mind, we've just released a new book of patterns, Emerald Isle, all ready for you to whip up something to wear this coming season. Devlin and Kildare are great pieces for when there's just a bit of chill beginning to form in the air. The vented sides of Devlin, and the lightness of the Inca Alpaca it's knit of, make Devlin a perfect layering piece. Kildare is knit in Mohawk Wool, whose organic shades result in neutral pieces that can easily be mixed and matched with most of your existing wardrobe. Cast on now and as the chill in the air gets a little more intense, these could be waiting for you to cozy up in. The relaxed boxy shape of Kilkee is modern. The positive ease also makes it everyday comfortable. The bulky weight yarn means that you can go quickly from start to finish. Casual with jeans, or dressed up with a fitted skirt, you're sure to get a lot of mileage out of this pullover and its striking side cables. I always want the option of wearing my fall jacket just a few weeks longer before pulling out the bulkier winter one. Do you? Wrapping a warm scarf like Dungloe around your neck will extend 'light coat weather' by keeping your neck and upper body a bit more toasty. Knit up in our new bulky weight, Big Liberty Wool, the tonal shades add even more depth to the textural stitches. By the time it's downright cold outside, you'll be more than ready for snowball fights and sledding with the Kinlough mittens. 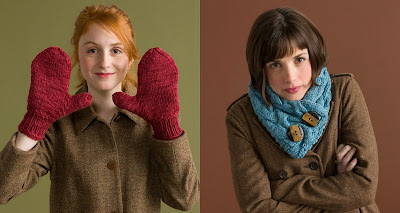 The fibers in the Big Liberty Wool mix team up to make these mittens both warm and durable. To keep the bitter cold off your neck? Clifden's double layers of cables will keep you snug as a well dressed bug in a rug, even in the deepest chill. With such a varied assortment of yarns represented, in so many lovely jewel tones and natural shades to choose from, the hardest part may be limiting yourself to casting on just one project from Emerald Isle. Then again, who says you have to limit yourself?